The Internet appearance of the TecAlliance product brand TecDoc has been reworked to match the design of the website for the umbrella brand TecAlliance and that of the other product brands TecCom and TecRMI so that it now shines in new splendour. Thanks to the modern look and feel and the new navigation the pages are more attractive and clearer. You can try the new TecDoc web site at www.tecdoc.de. The content is available in German, English, French, Dutch, Italian and Spanish; there are also – at first with slightly less content –versions of the website in Polish and Russian. 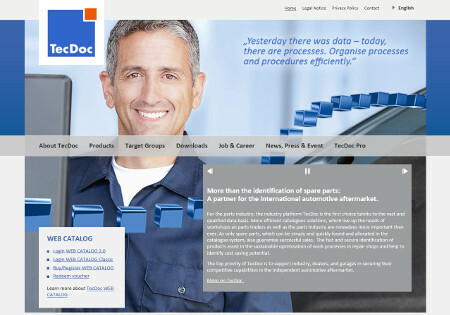 As usual the TecDoc website provides general information about the TecAlliance product brand TecDoc as well as comprehensive overviews of the different products such as the TecDoc CATALOG, the TecDoc WEB SHOP and the data maintenance module TecDoc DMM. The login to TecDoc WEB CAT 2.0 and WEB CAT Classic takes place using the new website. With a click on the respective link on the homepage the customer is taken to country or language selection. After the choice of country or language a new window opens for login. To arrive directly to this login page in the future it is recommended to add the login window to the Favourites or Bookmarks in your web browser. The navigation points TecDoc Pro and Downloads are now linked to the new TecAlliance customer area that is only available to authorised users. Registration and login to this customer portal take place at the web page http://login.tecalliance.net/en/login.html.